After surviving an all but certain death to video games, pinball is back. Some argue the industry is making a comeback with arcade-bars popping up everywhere and pinball manufacturers doing more than surviving. One of the issues that keep the industry small and focused on a limited market is its lack of innovation (and its lack of diversity- but that is another topic). This is not surprising given the industry is dominated by one major manufacturer and a smattering of smaller firms attempting to compete. 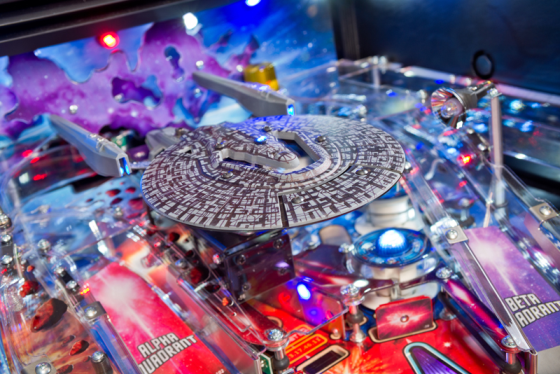 To attract a broader audience, pinball needs to come into the 2000's in not only its use of new technologies but in its qualitative game experience. Here are a few examples of opportunities for modernization. When I asked about those little plastic pieces that look like upside down icicles I was told, “Those keep the ball from jumping off the ramp.” Okay, seems legit. Except that more recently I found them in TOTAN fixed upon the top of an acrylic of a skeleton. In this case they are supposed to be knives. So the same piece is a knife and a ball jump stopper? While that makes sense from a cost perspective, aesthetically it is a bad choice. Granted this is not what we would call a modern game however these icicles are found on the newest of machines. Pinball is mostly played in the homes of collectors; the noise (and space factor) has been the topic of heated debates between couples everywhere. As much as I love the sounds of TOTAN, I’d be happy to never here the sounds of Metallica ever again (MET is a great game and really fantastically designed but the music is not my favorite). Jersey Jack has recognized this issue and incorporated earphone capability so the player can rock it while others chat it up or enjoy their current Netflix series addiction. The game also integrates coin door audio controls, which are typically found inside the game. These simple innovations make the Wizard of Oz a more enjoyable game to have in your home. Boy I’d sure love to have one in my home (hint, hint). Color DMDs are considered to be the latest and greatest and yet are not standard in today’s games. This seems crazy. While the Wizard of Oz has completely eliminated the DMD, every Stern Pinball release comes with the standard single color DMD. Recently, while attending the 2014 Rocky Mountain Pinball Showdown a young man in his early 20's stopped by our booth to chat. He expressed his enthusiasm for pinball and his vision to build a pinball machine using the latest technology advancements. The DMD board was just one of the aspects of current machines for which he showed disdain. How could this technology still be in use in 2014? Not over the noise of pinball but the really bad silver screws and nuts everywhere on top of everything. Some of the most beautiful displays in games are compromised by the silver nuts and screws that attach them to the play field or backboard. With so much available with new manufacturing capabilities (for example, 3D printing) it seems odd that pinball still uses this rather visible attachment device. Take the display on the backboard of the Stern Star Trek. The purple space nebula is vibrant in color and gives the feeling that the Vengeance ship is flying through space. Except for those darn screws that attach it to the backboard. 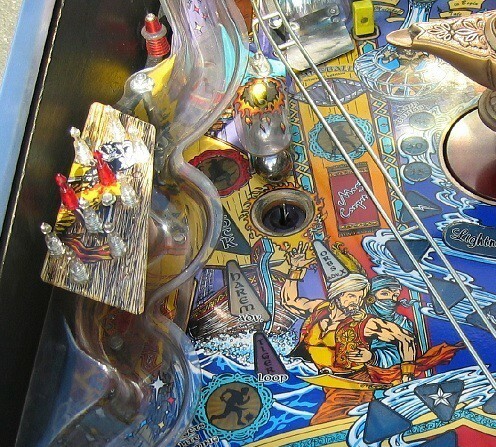 What people are enjoying about pinball today is in part, the social dimension it brings to gaming. Video games, in spite of the ability to play others online, lack that tangible, face-to-face human experience. Unfortunately however, pinball manufacturers have narrowed in their target audience dramatically over the last 20 to appeal to an audience of largely white males (I realize this is a provocative, broad stroke generalization for which I encourage thoughtful debate). To really innovate and truly thrive as an industry, pinball must reach beyond this audience through exciting new themes that will appeal to new markets. Again Jersey Jack has stepped into this arena with Wizard of Oz and perhaps the rumored Walking Dead by Stern will reach out as well. There are other examples- ramp style, playfield lighting, pop bumper design, to name a few. You might be saying to yourself, these are all qualitative aspects of the game and improving them will not change game play. True. The way a game looks does not directly change the depth of the rule set or the challenge of the shots. But we all know that there is a point where the qualitative aspect bleeds into the quantitative aspect of the game. More importantly, when purchasing a luxury item (and pinball machines are for certain luxury items), you want it to play great and look great. And game manufacturers know this too otherwise there would be little focus on the look and feel of the game. There is hope- new pinball manufacturers (Dutch Pinball, Multimorphic, Zidware, Heighway, Skit-B Pinball, Spooky Pinball) are attempting to bring great innovations to the game. They are disrupting the industry as it has been in an effort to steal away their share of the pinball market. The question is, who will produce that game-changing machine that takes pinball to a whole new level? What ideas do you have for innovating the game of pinball?